HAVANA, Cuba - Cuba welcomes the proposal of the High Representative for Foreign Affairs and Security Policy of the European Union (EU), Catherine Ashton, of starting a political dialogue with Havana, Foreign Minister Bruno Rodriguez said on Thursday. 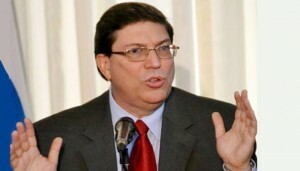 At a press conference held at the headquarters of the foreign ministry in the Cuban capital, Rodriguez pointed out that the decision was communicated to the EU ambassador to Cuba, Herman Portocarero, in response to a request made by EU on February 10. He stated that Cuba will act constructively, in order to resume the political dialogue and cooperation on a reciprocal basis, without conditions, with full respect for the sovereign equality of states, the legal framework and institutional arrangements of the parties.